This page is written by the game's inventor, Daniel Hollombe. I invented this about 14 years ago. What makes this variation unusual, is the fact that the various pieces are not distinguished from one another by shape or symbol, but by color. Each disk (or "Bird") has a black spot on one side and a white on the other, that determine which player it belongs to. Like Shogi, when a piece is captured, it then becomes the property of the capturer, and can be flipped over to then be re-entered on to the board to be part of his or her army. The fact that this game has no long-range pieces might seem a bit off-putting at first, but once the game starts, it's rather amazing just how fast the center of the board becomes a clash of winged armies. 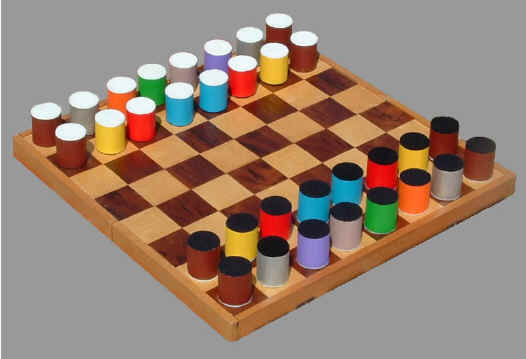 Although most games that consist of pieces that can only move two spaces at a time are usually played on smaller boards, the fact that throughout most of the game, all 32 pieces are either on the board, or waiting to be dropped there at any time, justifies the full size 8x8 board. There are no equivalents of pawns in ths game, and since the Shogi method of regaining pieces is always in effect, they are not needed. I find that this makes for a much less cluttered playing field. The final unusual twist in this game, is the fact that each player starts out with not one, but two "Kings" (Sparrows) that must be captured, in order to win the game. This might also seem a bit daunting at first, but it's also a bit calming to know that all is not lost if one loses a silver piece, because it can be regained. On to the rules! The Canary moves one or two spaces orthogonally in all four directions. The Bluejay moves one or two spaces diagonally in all four directions. The Robin moves like the Knight in Standard Chess, except that it's possible to block it (more on that later). The Woodpecker moves two spaces orthogonally or diagonally in all eight directions. The Sparrow moves one space in all eight directions. The Tern combines the movements of the Robin and the Woodpecker. Here's where it gets interesting. If you know anything about mixing colors, you know that Red and Blue make Purple, therefore, the Pigeon combines the moves of the Robin and the Bluejay. Because Blue and Yellow make Green, the Gull combines the movements of the Bluejay and the Canary. Finally, Yellow and Red make Orange, so the Owl moves like a combination of the Canary and the Robin. Obviously, this game can also be a fine educational tool for teaching kids how to mix paints. Each Player starts out with twelve minor birds (the primary colored pieces, plus the Sparrows and Woodpeckers) that have a choice of eight spaces they can move to from any centrally located cell. And, each player also starts out with four major birds (the secondary colors, plus the Tern) that each have a choice of sixteen different potential destinations per turn. Although it really doesn't matter who initiates, players who are used to FIDE chess, might wish to retain the rule about white moving the first piece. If a player wishes to move a bird two spaces vertically, diagonally, or knight-like, and one of his other birds is resting on the square in between, the intervening bird can be jumped over. A player cannot, however, jump over one of his/her opponent's birds. This rule applies throughout the duration of the game. Therefore, if the player with the White birds wishes to move one of his major birds on the first turn, he/she has plenty of options. The Owl can move to 6-B, 6-C or 6-D (see the set-up illustration above). The Gull can move to 6-B, 6-D or 6-F. The Tern has the most options, being able to move to 6-C, 6-D, 6-E, 6-F or 6-G. Finally, the Pigeon can move to 6-D, 6-E, 6-G or 6-H.
Let us assume it is White's turn to move. The Tern on 5-D can easily jump over the friendly Woodpecker on 6-D to capture the Gull on 7-E, the Robin on 7-D, or the Canary on 7-C. For that matter, it can also capture the Robin on 4-F. It is not capable of capturing the Sparrow on 7-B, because of the opposing Owl on 6-C, blocking it's way. For that same reason, the Canary on 4-E may capture the Bluejay on 2-E, but it cannot capture the Sparrow on 4-G. It can, however, capture the Robin on 4-F that is preventing it from capturing the Sparrow. If it does this, it then really will be threatening the Sparrow on 4-G! Unlike the Knight in FIDE Chess, the Robin in Aviary can be blocked, but it takes two opposing birds to do it. This also applies to the Pigeon, the Owl or the Tern, whenever they move like the Robin. The Robin either moves one space orthogonally then one space diagonally, or vice versa. Figure #1 illustrates how placing an opposing bird in the intervening diagonal square is not enough to prevent the White Robin from capturing the Black Gull via the orthogonal-first route. Figure #2 demonstrates the same principle in reverse. Figure #3 is yet another demonstration of how a bird can easily jump over one of it's comrades. Only in Figure #4, is the Robin completely sealed off from the opponent's Gull (and for that matter, being threatened by both of the intervening birds). Whenever one captures an opponent's bird, it becomes part of the capturer's off-the-board arsenal. By flipping it over, the bird changes from black to white or vice versa, and is ready to be parachuted back onto the board Shogi-style at any time. As a courtesy to the opponent, all captured Birds should be stored next to the board where they are clearly visible, making it easier for both players to plan their respective strategies. When a Bird is returned to the board, the act of doing so counts as one move. It can be placed on any square, as long as it is unoccupied. Note that when an opponent is down to one Sparrow, this is a very common way of facilitating a checkmate. Whenever a Sparrow is threatened, the offending player must always say "Check." Unlike FIDE Chess, however, unless one is down to his or her last Sparrow, moving it out of harm's way is not mandatory, nor is it obligatory for the offending player to capture it after it has not been moved, although there are very few situations that would render either of those decisions wise. If one has only a single Sparrow on the board, and one (or two) in the off-the-board arsenal, and the former is captured by the opponent, another Sparrow must immediately be re-entered on to the board. In other words, for obvious reasons, each player must always maintain at least one Sparrow on the board throughout the duration of the game. Figures 1 through 4 illustrate the fact that all one needs are two major birds to achieve a mid-board checkmate. Figure 5 demonstrates how, when a Sparrow is on an edge square, it's possible to checkmate it with two minor birds. Finally, Figure 6 shows how to win the game using only one bird. Note that none of these positions are possible with standard Chess pieces. This gives the players four distinct types of squares (black, white, black with dots/stripes, white with dots/stripes). This way, one is able to determine at a glance, what spaces across the board, any given Woodpecker is capable of landing on. As a final note on the subject, I'd just like to mention that this game is a natural for portable magnetic boards. The birds can be made from small wooden disks (that are easily available in most arts and crafts shops) and some paint. Simply glue a small circular magnet painted black on one side, and one painted white on the other. Bear in mind that the first few moves of this game mainly involve jockeying for position. One has to decide which pieces to send across the board, and which to keep behind to guard the Sparrows. The game is still too new to determine if there's an advantageous pattern yet, so don't worry about whether or not you're making the right decisions. Not yet, but I'm seriously considering it. Not available yet, but stay tuned! I love the color-mixing idea here. I would enjoy seeing a game that uses that and an Absorption-like mechanic. And maybe when a piece takes on too many elementals, it becomes a weaker "brown" piece? Daniel, while the game looks interesting, the color-coded pieces simply do not work for me on the computer screen. I have added Michael Howe's symbolic graphics as an alternative set for the ZRF (the color-coded pieces still come up first), and those are certainly the ones I will use to play the game when using Zillions. It is good to remember that what works on a board does not necessily work on the computer screen. <i><font color='#FF0000'>'If anyone would like me to zip up and email to them the alternative graphics set for Aviary, or if the inventor would like to see it posted on these pages, I'll be happy to provide. '</i><br> <br><font color='#000000'>I would definitely encourage anyone to re-design the pieces in any way they think might make it easier for them to play. 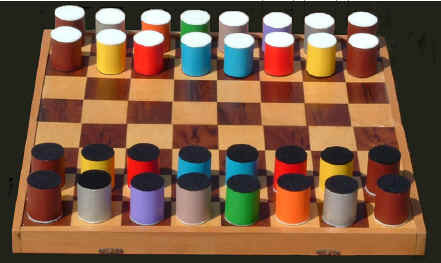 I do, however, believe that all the different colors are a big part of what give the game it's distinctiveness. In addition to any illustrations/symbols/arrows/dots you'd like to use, I would suggest perhaps adding a dash of the appropriate color as well. At least beginning players would be able to tell at a glance the value of the piece, depending on whether or not it's a primary or secondary color. <blockquote><i> I created an alternative piece set and board based on graphics from my next Nova Chess update. </i></blockquote> <p> Mike, if you send them to me, I will add them to the ZRF as an alternate piece set. It's always nice to have a choice. I'm with Moussambani on the swap giving Robin=Rook, as it would also give Canary=Caballo=Cannight (Knight with the initial pronounced!). It would also tie up Gull with Queen, and there is a resemblance both between the upper case G and Q and between the lower case ones.